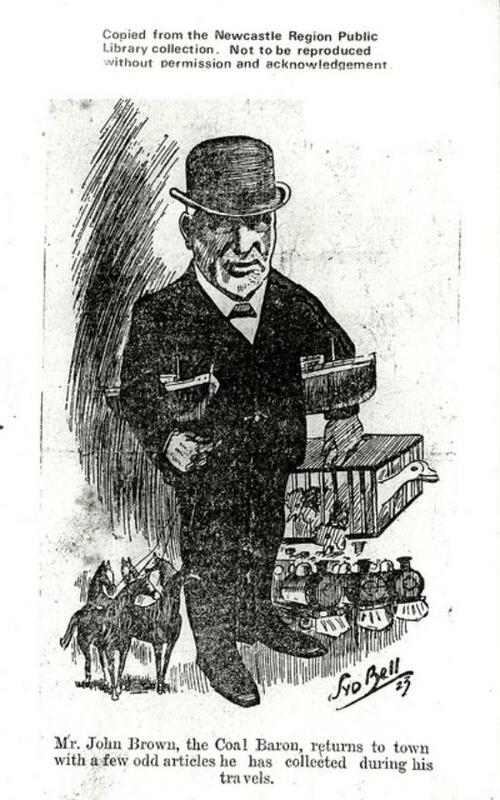 Cartoon of Mr. John Brown, the Coal Baron, 1923. Courtesy of the Newcastle Region Public Library. John Brown (also known as 'The King of Coal' and 'The Coal Baron'), was son of James Brown. James and his brother Alexander were co-founders of J&A Brown. John was born in 1850 near East Maitland (Four Mile Creek). At the age of fourteen he started to work in J&A Brown's Newcastle office. He then worked across various roles at Minmi mine, learning the different aspects of the mining business before traveling overseas to research new mining techniques. He soon became well known for these overseas excursions; always bringing back items for the mines (see the trains and ships in picture on the left). In 1882, John Brown became the general manager of the J&A Brown. Instead of relying on other companies to load and ship the coal, he tried to make J&A Brown as self-sufficient as possible, purchasing and privately owning wharves, collieries, tugs, trains, rail-lines and ship loading equipment. He expanded the companies' export business by marketing the coal overseas at cheap prices. Through J&A Brown, he acquired more land for mining, and took over the Richmond Vale Colliery, which changed its name to the Richmond Main Colliery. In partnership with his brother William, purchased Stanford Greta Number 2 tunnel, which became Pelaw Main Colliery. These mines were known for having the most up-to-date technology. The Baron was known by some for being severe towards his employees, always opposing the Unions, and not giving in to strikes. He refused to sell his employees the land they lived on, and so he could threaten them with eviction if they were to strike. He often quarrelled with the Colliery Employees' Federation, eventually suing them for loss of trade. Despite much industrial ill-will, the Australian Worker, admitted that on infrequent occasions, Brown was comparatively generous to his employees. John was also an accomplished horse-breeder, having over 500 horses, many of which were fine race horses. He often brought animals back from his overseas trips (see animals in picture above). John Brown died of a heart-attack in 1930. At his death he employed more than 2,500 people. His funeral was a huge affair, attended by many who came to see a 'show', reported to be a disrespectful crowd. "When I started at C & A I was told the story of the plumber who used to go and fit tap washers at his residence. He used to take the train down to Newcastle from Hexham, fix the tap and then return to work at Hexham Workshops. He did it every time until one day he was off work and another workmen went down. After changing the tap washer, John Brown gave the workman a gold soverign for doing it, As soon as he returned to the works, he told his mates and then came to the conclusion why the other man was the only one to go down. From that time, they took it in turn to change the tap washers so that they all shared in the gold soverigns. Definitely told a true story." "AUSTRALIA'S "COAL KING"." Sunday Times (Perth, WA : 1902 - 1954) 9 Mar 1930: 1 Section: Second Section. Web. 26 Apr 2013 <http://nla.gov.au/nla.news-article58377001>. "DEATH OF JOHN BROWN." The Central Queensland Herald (Rockhampton, Qld. : 1930 - 1956) 13 Mar 1930: 34. Web. 26 Apr 2013 <http://nla.gov.au/nla.news-article70267506>. "DEATH OF MR. JOHN BROWN." The Longreach Leader (Qld. : 1923 - 1954) 7 Mar 1930: 11. Web. 26 Apr 2013 <http://nla.gov.au/nla.news-article37217555>. "John Brown Dead." Advocate (Burnie, Tas. : 1890 - 1954) 6 Mar 1930: 5 Edition: DAILY. Web. 26 Apr 2013 <http://nla.gov.au/nla.news-article84924703>. J. W. Turner, 'Brown, John (1850–1930)', Australian Dictionary of Biography, National Centre of Biography, Australian National University, http://adb.anu.edu.au/biography/brown-john-5388/text9121, accessed 26 April 2013. "LATE COAL BARON." Recorder (Port Pirie, SA : 1919 - 1954) 10 Mar 1930: 1. Web. 26 Apr 2013 <http://nla.gov.au/nla.news-article95861103>. "MAITLAND COALFIELD." The Sydney Morning Herald (NSW : 1842 - 1954) 24 Sep 1906: 8. Web. 16 Jul 2013 <http://nla.gov.au/nla.news-article14816541>. "NEWCASTLE." The Sydney Morning Herald (NSW : 1842 - 1954) 16 Jul 1897: 5. Web. 16 Jul 2013 <http://nla.gov.au/nla.news-article14115563>. "SOUTH MAITLAND COALFIELDS." The Sydney Morning Herald (NSW : 1842 - 1954) 17 Nov 1902: 3. Web. 16 Jul 2013 <http://nla.gov.au/nla.news-article14516008>.